I had to take a break last week from wrapping up the week’s gaming news and putting a big floppy bow on it, thanks to a 103-degree fever (40 degrees for you not-Americans). But now I’m back! I’d say “Better Than Ever,” but I’d be lying. This is gaming news for August 22 – 26. Signs this week point to a Duke Nukem resurrection of some sort. The Duke’s websitehas been especially active this week, with a “Happy 20th Anniversary” banner (celebrating twenty years since Duke Nukem 3D), a bold “COMING SOON” and a countdown that peters out on September 2—the day, coincidentally, that Gearbox is holding a panel at PAX. Keep an eye out next week. WB continues to make the most baffling decisions in regards to the PC. This week, it’s good news that simultaneously feels like a kick in the face. A timeline: Back in 2015 WB released Mortal Kombat X for the PC and it was busted. Not a ton of people bought it, presumably because word got out it was busted. So six months ago, WB says Mortal Kombat XL, essentially the “Game of the Year” edition with all of the DLC, isn’t coming to PC because not enough people bought it. But—surprise!—that’s not actually true. This week NetherRealm’s Ed Boon announcedXL is coming to PC after all. It’s good news, but why the hell didn’t WB just support the game through its life cycle in the first place? I can understand not wanting to bringInjustice 2 to PC after Mortal Kombat’s disappointing sales—I’d be annoyed, but it’s their call. But to hobble the game you already had people pay for, then six months later try to make it up to them? Nah. My college roommate’s favorite game (maybe of all time) was ToeJam and Earl. I imagine he’s pretty damned excited this week, because Adult Swim and Humanature released some footage of the upcoming Kickstarted remake/sequel/thing they’ve got coming in 2017. More broken game news: This week Ubisoft delayed all upcoming DLC for The Divisionin order to “focus entirely on bug fixing, game balancing and other improvements.” There are a number of tweaks mentioned, including adjustments to loot drops and how fast enemies die. What’s not mentioned, interestingly enough, is cheating in the Dark Zone. Last I’d heard, cheating was running rampant in the Dark Zone on PC and it’s what drove most of the audience away. Maybe Ubisoft fixed that? Anyway, it’s a good move by Ubisoft even if it smacks a bit of too-little-too-late. MaybeThe Division can experience a Destiny-like revival, a year post-launch. Or maybe in two years it’ll go free-to-play like Evolve. In other Ubisoft news, a bevy of release dates dropped this week. Eagle Flight is coming to the Rift on October 18 (December 20 to the Vive), Star Trek: Bridge Crew hits the Vive and Rift on November 29, and Werewolves Within on December 6. And that extreme sports game Steep? Well that one’s coming on December 2. Blizzard continues to kill it with these amazing Overwatch shorts. Most recently they released The Last Bastion, which made the game’s most unlovable robot somehow lovable. Maybe next time you won’t even yell at the teammate you see playing Bastion on attack. As a kid I’d play SimCity 2000 in a very particular way: I’d turn off all the disasters, build a massive megalopolis across the whole map, save, and then spawn a dozen disasters at once. Just to see what happened. I’d be a terrible god. 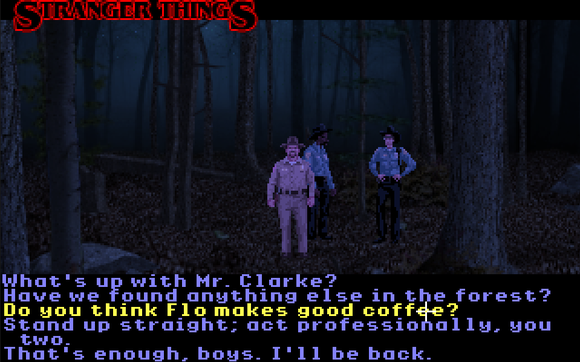 Netflix’s Stranger Things is pretty great at emulating all things ‘80s, so it’s only logical that someone whipped together a tie-in game in the style of the great old SCUMM engine. It’s just a demo at the moment, but they nailed the art style about as well as Ron Gilbert’s new Thimbleweed Park. Hopefully it doesn’t get shut down by Netflix like all ill-fated fan projects these days.